This is Khalai. She is seven years old. Her name means ‘the good one’ in her language, Lubukusu. This is Khalai. She is seven years old. Her name means 'the good one' in her language, Lubukusu. Dis a Kalaahi. Shi a sevn iez uol. Ar niem miin 'di gud-wan' inna fi ar langgwij, Lubukuusu. 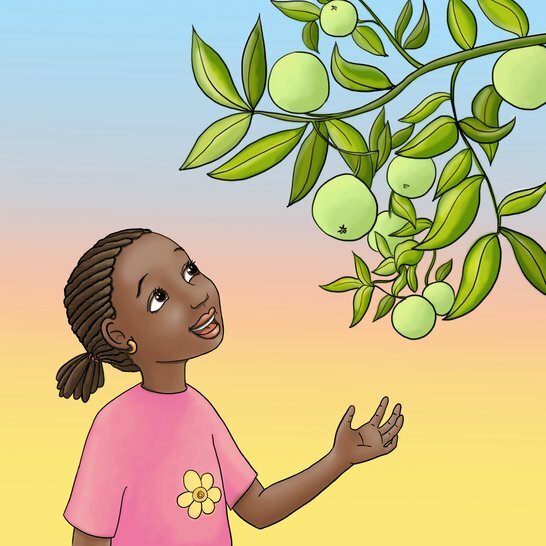 Khalai wakes up and talks to the orange tree. 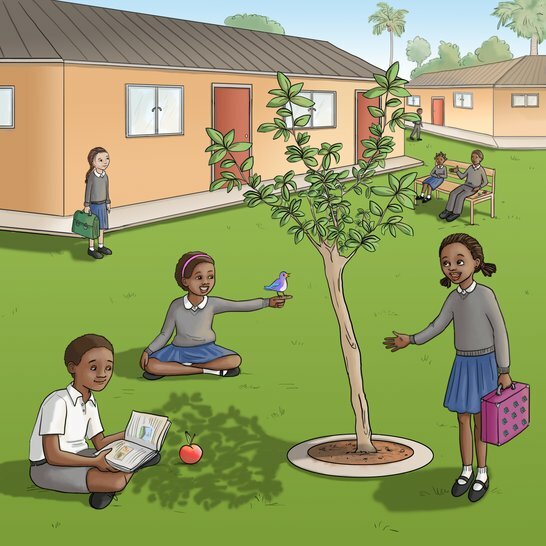 "Please orange tree, grow big and give us lots of ripe oranges." Kalaahi wiek op an a taak tu di arinj chrii. "Du arinj, gruo big an gi wi uol iip a raip arinj." Khalai walks to school. On the way she talks to the grass. 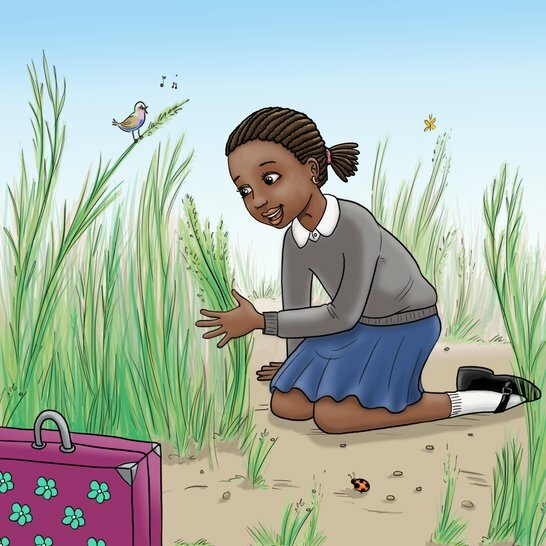 "Please grass, grow greener and don't dry up." Kalaahi waak go a skuul. Pan ar wie shi taak tu di graas. "Du graas, gruo griin-griin an dohn jrai op." Khalai passes wild flowers. "Please flowers, keep blooming so I can put you in my hair." Kalaahi paas wail flowaz. "Du flowaz, gwaan blasom so mi kyan put yu ina mi ier." At school, Khalai talks to the tree in the middle of the compound. "Please tree, put out big branches so we can read under your shade." 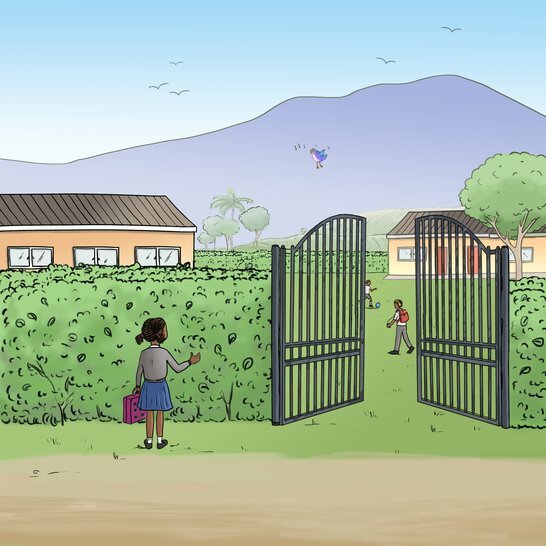 A skuul, Kalaahi taak tu di chrii inna di migl a di skuulyaad. "Du chrii, push out big lim so wi kyan get fi riid anda yu shied." 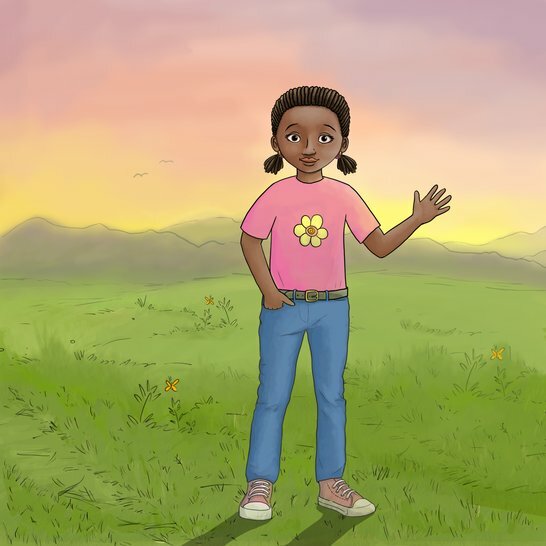 Khalai talks to the hedge around her school. "Please grow strong and stop bad people from coming in." Kalaahi taak tu di ejin roun ar skuul. "Du, gruo chrang an tap bad piipl fram kom iihn ya." 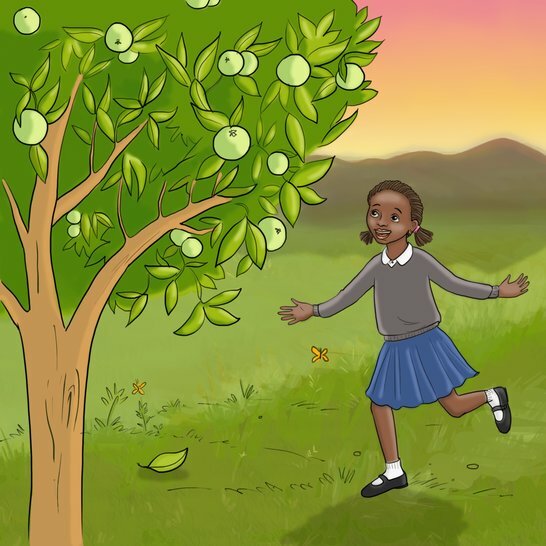 When Khalai returns home from school, she visits the orange tree. “Are your oranges ripe yet?” asks Khalai. 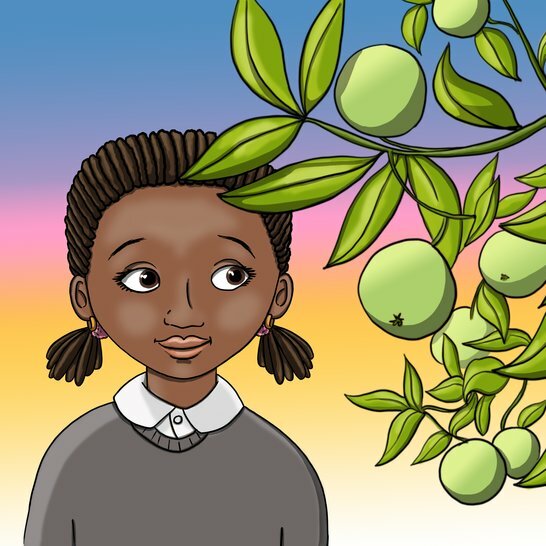 When Khalai returns home from school, she visits the orange tree. "Are your oranges ripe yet?" asks Khalai. Wen Kalaahi go bak uom fram skuul, shi go luk pan di arinj chrii. "Yu arinj dem raip yet?" Kalaahi aks. 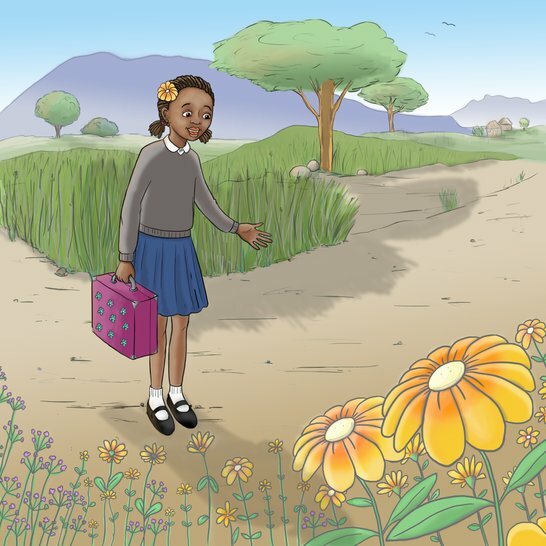 "The oranges are still green," sighs Khalai. "I will see you tomorrow orange tree," says Khalai. "Perhaps then you will have a ripe orange for me!" "Di arinj dem stil griin," Kalaahi bieli se. "Mi wi si yu tumaro arinj chrii," Kalaahi se. "Miebi dem taim de yu wi av wahn raip arinj fi me!"